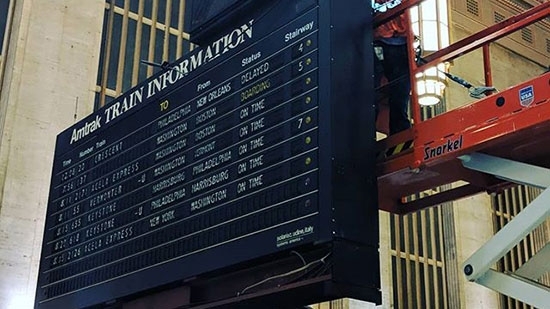 Amtrak has begun removing the iconic Solari split-flap train information board at 30th Street Station in Philadelphia. It will be taken down this weekend. The board will be moved to the Railroad Museum of Pennsylvania in Lancaster County. It is the last flipping analog display board in use in Amtrak's system. In a statement Amtrak says, "Temporary boards with train information have already been installed and will be supplemented by Amtrak staff that will be on hand to direct customers. The new Passenger Information Display System installation will be complete in late February." It is not known exactly what the new system will look like. U.S. Congressman Brendan Boyle has been advocating for the sign and for the many people who've spoken up about it's removal. The existing system is not ADA-compliant and cannot sync with boarding gates to give realtime information. However, riders enjoy the clickety-clack sound and turning letters, as opposed to just another screen. Local Philadelphia company, Oat Foundry, has met with Amtrak several times to discuss a modern split-flip solution. In the past two weeks, a handful of Saint Joseph's University students have been the victims of off-campus, armed robberies on three occasions (January 10, 13 and 23). Police officials have indicated that recent cell phone robberies are part of a larger trend impacting other areas of the city as well. A fourth event, occurring in Roxborough, was reported but quickly resulted in property recovery and arrest of perpetrators, not matching the details of the other events. Saint Joseph's University is working closely with the Philadelphia Police Department to investigate and increase patrols. -Maintain increased awareness of surroundings. Saint Joseph's University students and employees are encouraged to call Public Safety at 610-660-1111 if they have more information about these or other events. 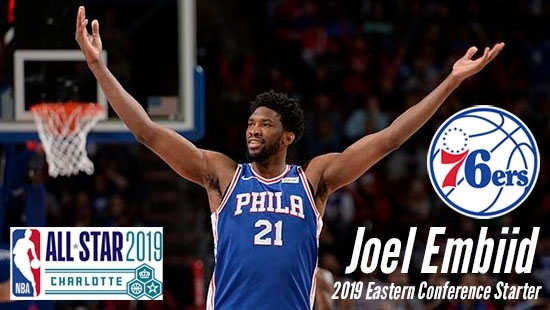 Philadelphia 76ers' Joel Embiid was selected as an Eastern Conference starter for the second year-in-a-row for the NBA All-Star Game. The game will be held on Sunday, Feb. 17 at 8 p.m. ET at Spectrum Center in Charlotte, N.C. Joining Embiid in the East are Boston Celtics' Kyrie Irving (guard), the Toronto Raptors' Kawhi Leonard (frontcourt), the Charlotte Hornets' Kemba Walker (guard), and the top vote getter Milwaukee Bucks' Giannis Antetokounmpo. The Western Conference starters include top vote getter Los Angeles Lakers' LeBron James, the Golden State Warriors' Stephen Curry (guard) and Kevin Durant (frontcourt), the Oklahoma City Thunder's Paul George (frontcourt) and the Houston Rockets' James Harden (guard). The reserves will be announced next Thursday. Sixers Ben Simmons and Jimmy Butler have a chance to be selected as a reserve.